I absolutely ADORE their compression socks! They're cute and functional! I even wear them under my pants when I go to work (to keep my legs fresh for after-work training sessions)!! I own WAY too many pair! The Garmin Vivoactive is my everyday watch. The functionality of this device is amazing. It's a smartwatch, fitness tracker and training watch. I pretty much only take this sucker off to shower to charge. Aside from that, I use it as my alarm clock, medication reminder, fitness tracker and swim/bike/run training watch. On top of that, it's good looking enough to wear to work! 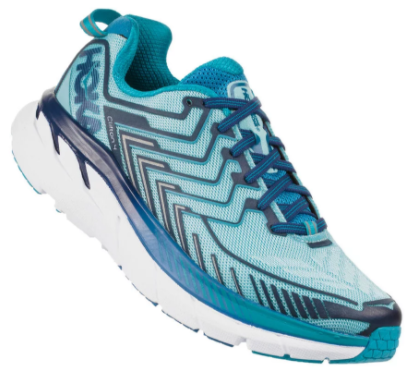 Oh my pretty Hoka One One Clifton 4 running shoes! You make my heart swoon and my feet sing! It was literally love at first run with these shoes. They feel extra responsive over the Clifton 3 and offer more arch support! Every run with these shoes is pleasurable! The SPIbelt was a life-changing discovery. This awesome belt allowed me to take my phone off my arm (which put an end to the scapular cramps I would get on that side) and put it on my waist. There is no bouncing. Add some clips to it and it can serve dual purpose as gear/nutrition holder and bib belt during races! The Simple Hydration bottle. Quite possibly the world's greatest invention. I don't remember how I stumbled across this during my online searching, but I am SO thankful I did. This invention allowed me to ditch the hydration belt and tuck a water bottle in my sports bra/tank or shorts. During my last tri, which was in August (let's just say Indian Summer in Houston is a TEENSY bit warm), I froze my bottle to tuck into my tank for the run to keep me cool (as there would be no ice at the aid stations). It helped me stay cool and provided me quick access to water to keep me hydrated. Bolder Bands. My lovelies! These little headbands seem so simple, but are ingenious! They keep my hair out of my face, don't move and look great! I didn't realize how great these are for training until I did a bike ride without one and was wiping sweat off my cheeks the whole time. I had NO idea how much sweat these little suckers were collecting! No training prep is complete with out them. These wrap bracelets by Momentum Jewelry are a great way to remind yourself to keep moving! Something about the physical act of putting the bracelet on makes you OWN the sentiment on the charm.